What Is DA Form 3433-2? DA Form 3433-2 also known as the Supplemental-A Employment Application Form for Child-Youth Services Positions is a document distributed by the Department of the Army (DA) and used by soldiers applying to Non-appropriated Fund (NAF) positions requiring child care. The DA 3433-2 must accompany forms DA 3433 and DA 3433-1 in all employment applications for child- and youth care-related jobs. The newest version of the DA-issued form was released in August 2002 with all previous editions now obsolete. An up-to-date version is available for download below. The DA 3433-2 Form - commonly mistaken for DD Form 3433-2 - is used for determining if the applicant is affected by any legal restrictions or has a history of law violations. The information provided by the form undergoes a thorough background check by the Quality Review and Advisory Panel (QRAP). Filing the form is voluntary. However, refusing to file the form will lead to the applicant being rejected from certain jobs and will decrease the overall chance of hiring. For use of this form, see AR 215-3; the proponent agency is DCS, G1. To determine your eligibility for service in a child care services position. law violations or other lawful purposes. the first step toward getting the job, if you do not answer these questions. FELONY OR A VIOLENT CRIME? HAVE YOU EVER BEEN ASKED TO RESIGN BECAUSE OF OR BEEN DECERTIFIED FOR A SEXUAL OFFENSE? If so, provide an description of the case disposition. up to 5 years, or both. DA FORM 3433-2, JAN 2002, IS OBSOLETE. Fill in your basic identifying information: your name, date of birth, social security number and address. Fill in the job announcement name or title. Provide the necessary contact information: your work phone and personal phone number, a fax number or an e-mail address. Your personal phone number will be the first way to contact you. If you wish to only be contacted via personal phone only fill in that field alone. Box 9 covers past sexual offenses, substance abuse felonies, violent crime accusations or arrests for child-related crimes. Check the appropriate option and provide a written description of the case disposition if there was one. All information you provide will be subject to a variety of background checks. The DA 3433-2 will be ready for submission after you sign and date the form in Boxes 10 and 11. The NAF employment packet consists of three forms: DA form 3433, DA 3433-1 and DA 3433-2. DA Form 3433, Optional Application for Nonappropriated Fund Employment is a form used with or instead of a resume by service members wishing to apply for NAF positions. 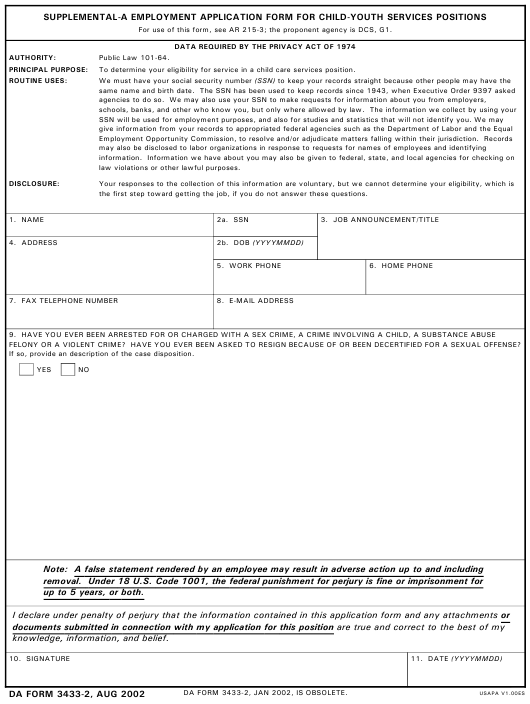 DA Form 3433-1, Supplemental Employment Application Form is a form completed by the applicant selected for NAF employment providing previous work experience, an overview of skills and education history.